Why have infant mortality rates risen in Brazil? For the first time since 1990, the number of Brazilian children who died before their first birthday has risen. 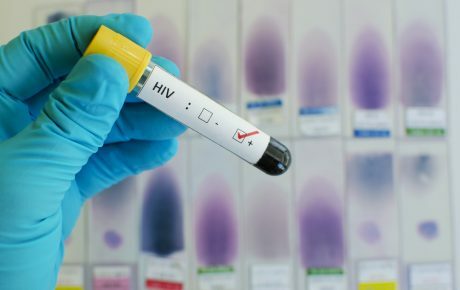 According to data from the Ministry of Health, in 2016 Brazil registered a rate of 14 deaths for every 1,000 births – up by 4.8 percent from the previous year. And experts point out that the rate is set to continue this worrying trend when numbers from 2017 are measured. 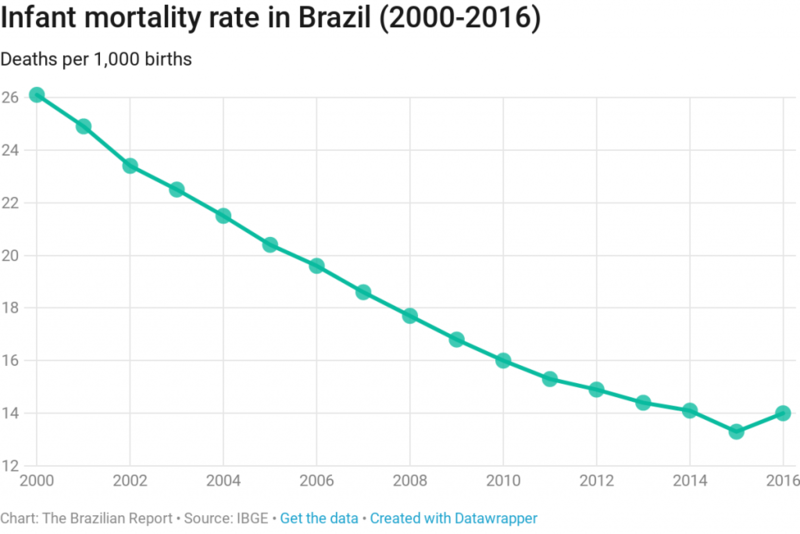 The 2015-2016 zika virus outbreak and Brazil’s recent recession (the worst on record) are the biggest reasons for the bump in infant mortality rates. Zika is a mosquito-transmitted disease associated with severe birth defects, such as microcephaly. By December of last year, the Brazilian government confirmed 1,384 cases of babies with microcephaly linked to a zika infection. As the disease scared the population, many women opted for preventing or interrupting pregnancies, which lowered the number of births in the country (something that affects the final infant mortality rate). The recession, on the other hand, is associated with so-called “avoidable deaths,” provoked by diarrhea or pneumonia. These deaths are the result of families’ loss of revenue, to the stagnation of social programs, and to budget cuts to the public healthcare system. Infant mortality includes the death rate among children of less than one year old and is a key stat to measure a country’s development. In Brazil, this rate was systematically going down, by an average of 4.9 percent a year, since 1990 (data from previous years were calculated according to different criteria). Until 2016, Brazil was actually better than the global average for the infant mortality rate reduction, which was at 3.2 percent, according to a 2017 Unicef report. 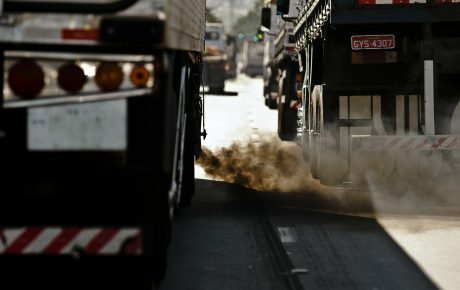 “It should probably get worse, as we’re still computing the data from 2017,” declared Fátima Marinho, a director at the Ministry of Health. Among babies up to one year old, the absolute number of deaths went up by 2 percent. From 1 to 4 years old, the number of deaths hiked by 11 percent. 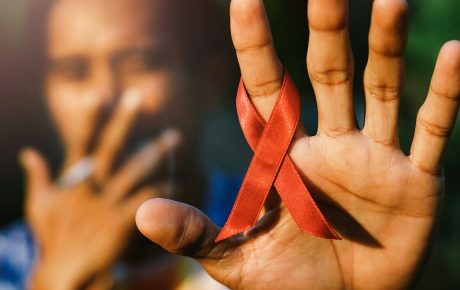 “The causes are connected to social vulnerability. The recession reduced employment rates, families’ revenue, and even government funding of crucial programs,” said Ms. Marinho. The most striking aspect of the peak in infant mortality is the causes of death. Between 2015 and 2016, the number of kids of less than 5 years old dying from diarrhea was up by 12 percent (from 532 to 597). Peripheral regions of Brazil, such as the Northeast, North, and Center-west, accounted for 74 percent of deaths. According to the Abrinq Foundation, a non-profit focused on children’s and teenagers’ rights, the numbers are a direct consequence of budget cuts to programs such as Bolsa Família, the world-famous cash transfer program launched during the Lula administration, and programs to help pregnant mothers and family planning. Child malnutrition, for instance, reached 13.1 percent in 2017, rising from 12.5 percent in 2015 and 12.6 percent in 2016. According to experts, infant mortality is primarily caused by premature births, fetus malformations, asphyxia, and infections. Most deaths are recorded within the first week of life. “Austerity measures shouldn’t touch social protection policies. That has a huge impact on the lives of poorer families,” declared Abrinq’s Executive Manager, Denise Cesario. These cuts started during former president Dilma Rousseff’s administration and got more drastic after she was impeached and Michel Temer took over as head of state. According to Abrinq, increases to the Bolsa Família budget since 2016 have failed to match inflation. This year, the program’s initial budget was of BRL 28.7 billion but was later cut to BRL 26.5 billion. 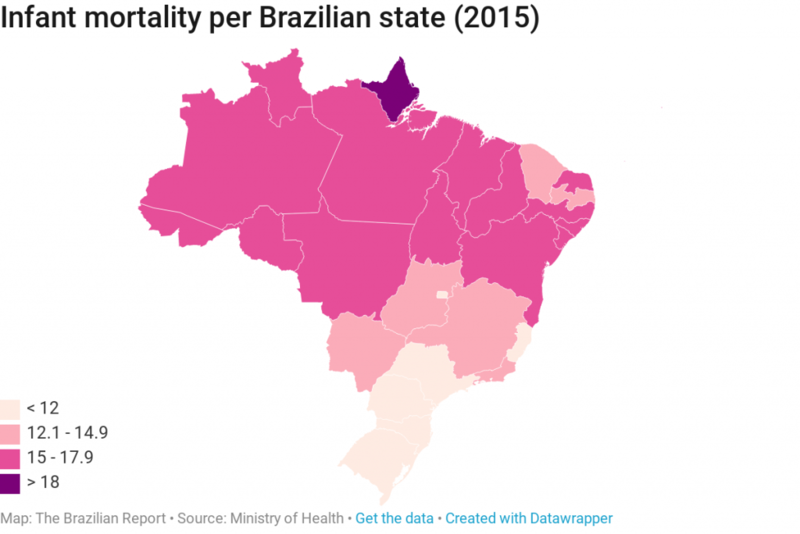 Data shows that infant mortality went up in 20 Brazilian states. The biggest spikes were in Amapá, Amazonas, Bahia, Pará, Piauí, and Roraima – the latter was also affected by the intense migration of Venezuelan refugees. In those states, the infant mortality rate was at 19.6 per 1,000 births, having increased by 14.6 percent (a growth rate three times as big as the national rate). 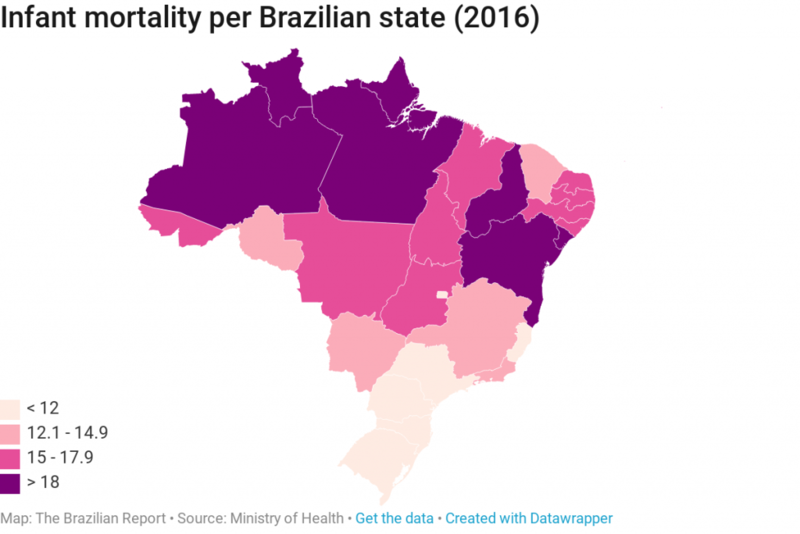 Only in seven states did infant mortality rates go down: Rondônia, Acre, Rio Grande do Norte, Alagoas, Paraná, Santa Catarina, and the capital, Brasília. 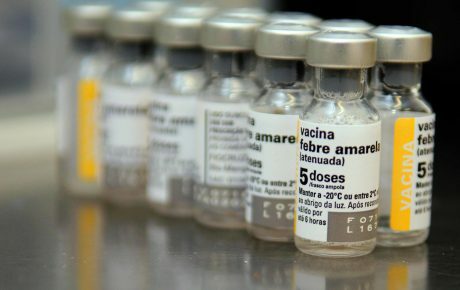 Vaccination coverage is below the recommended level in approximately one-quarter of Brazilian municipalities. Data from the Ministry of Health shows that the MMR vaccine (measles, mumps, rubella) covered 100 percent of the target population in 2003. Now, this rate is at 85 percent. The same thing has happened with polio, a disease that affects children. Coverage was at 100 percent back in 2000 but now is at only 78 percent. International recommendations have the coverage target at 95 percent. Pediatric healthcare coverage has also gone down in Brazil. Between 2010 and 2016, over 10,000 pediatric hospital beds in the public healthcare system have been deactivated, going from 48,300 to 38,200. An astounding 40 percent of municipalities (2,169 out of 5,570) don’t have a single pediatric bed to offer, which impacts diagnosis and treatment of diarrhea and pneumonia. As per Ms. Marinho, from the Ministry of Health, the Brazilian government has created a task force in partnership with academics to assess how to address the hike in infant mortality rates and propose urgent measures.